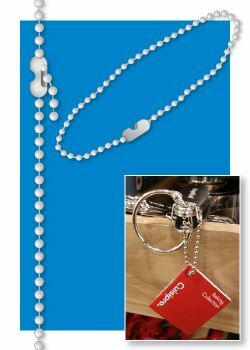 Beaded Chains are used throughout retail store environments to aide in holding lightweight signage, point of sale advertising products, small store fixtures,and merchandising equipment plus they they help act as a tether for brochures, sample books and swatches. Also known as ball chains, this product is a very popular fastener at retail. 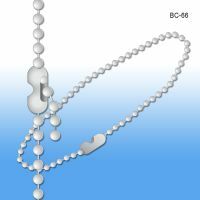 Minimum quantity for "Beaded Chain, Coupling Style, 6" Long, #6 Ball, BC-66" is 50. Minimum quantity for "Beaded Chain, Coupling Style, 24" Long, #6 Ball, BC-624" is 50. 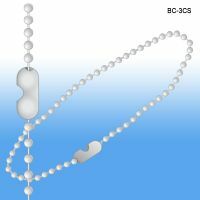 Minimum quantity for "Beaded Chain, Connector Style, 6" Long, #3 Ball, BC-3CS" is 50. 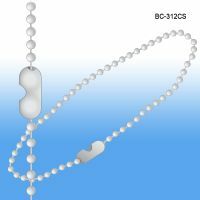 Minimum quantity for "Beaded Chain, Connector Style, 12" Long, #3 Ball, BC-312CS" is 50. Minimum quantity for "Beaded Chain, Connector Style, 24" Long, #3 Ball, BC-324CS" is 50. Minimum quantity for "Beaded Chain, Connector Style, 6" Long, #6 Ball, BC-6CS" is 50. 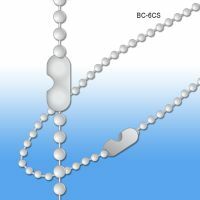 Minimum quantity for "Beaded Chain, Connector Style, 24" Long, #6 Ball, BC-24CS" is 50.